Photo taken by my grandfather of me modeling a dress made by my great-grandmother. I grew up in southern California—one of those rare persons who actually was born there. 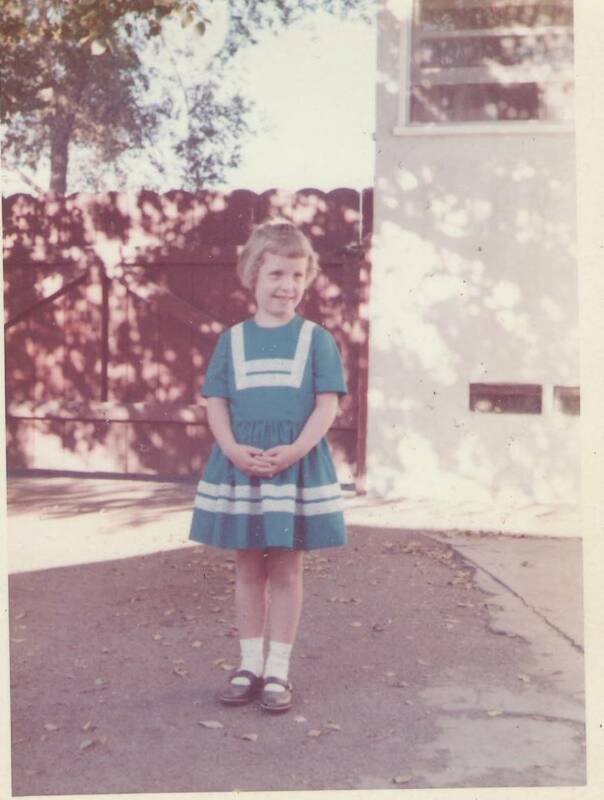 I grew up in the San Fernando Valley (“in the Valley!”) but lived in Pasadena for five years. I love Pasadena—still—and consider those years a time of deep inner growth and clarifying my purpose, and learning to deeply love others. I’m the oldest of five children and all of our first names begin with the letter “J” and our middle names begin with “A.” My mom, at times, likes to refer us to as the “Jam-Jam kids.” None of us have referred to ourselves this way without an eye-roll. In the late 1980s I joined Pasadena Mennonite Church which gave me language for my heart’s desire for social justice and peace. I grew up in a conservative evangelical home—attended Baptist day school, middle and high school but was always restless for something more in my theology. At that time and in those circles, social justice was called the social gospel and considered very dangerous. In college I was reading Sojourners and The Other Side and I kept coming across the term “Mennonite.” I had no idea who or what Mennonites were—at that time in Southern California there were very few Mennonites around. But a friend introduced me to Pasadena Mennonite Church and in my very first visit I felt at home. They were talking about peace and justice and missions. It also was the first time I received communion from a woman—a woman intern studying for ministry at Fuller Seminary. My life in that congregation is a keystone experience for me. I joined the congregation and was re-baptized like the early Mennonites. Four years later I was asked to be part of the pastoral team for a year while the lead pastor was on sabbatical to finish his dissertation. When I was first asked, I laughed—my “Sarah laugh” (Genesis 18:12) and said, “Ummm … sure.” I thought to myself, “This won’t get very far.” Little did I know. During that year I decided to move from Los Angeles to northern Indiana to study Christian spirituality, receive training to be a spiritual director, and move into ministry. I wrote my thesis on “Surrender? A feminist explores gelassenheit,” which focused on deepening one’s relationship with God and as a result, yielding and surrendering to God out of love. I am still learning how to live what I wrote. And, I met Kevin, who lived next door to me in campus housing. He’s a lovely man from the Canadian prairies. We have a bi-national marriage. I pastored in two different congregations for ten years and now edit Leader magazine from my home office, provide spiritual direction, lead retreats, and quilt. It is a good life. Other things I’m avid about: Anne Lamott, Kathleen Norris, Canadian singer Bruce Cockburn, NPR’s “Wait, Wait, Don’t Tell Me,” and the original series of “Law and Order.” Oh, and all things fabric! Have I said lately I miss you? June, My name is Lori Tate. I am a spiritual director, living in Jackson. I am a member of SDI and am beginning a new ministry called Soul Dig, providing spiritual direction and spiritual formation classes. I have a MA from Asbury Seminary and a DMin through the Marywood Dominican Center via GTF. I would be very interested in meeting for coffee sometime. hello! what a blessing to have found this site. my sister in law is “patiently” awaiting the arrival of their daughter they are adopting from the DR Congo. she was saddened to learn that they will not be allowed to travel to the DRC to pick her up because of current conditions within the country. the baby will instead be traveling with someone from the agency and meeting them in the states. my sister in law was very disappointed because she was very much looking forward to purchasing some fabric from the DRC to make her daughter some clothes from her country. do you know how i can get some authentic DRC fabric??? i have looked all over the internet and most fabric that is called DR Congo fabric is made in China. haha! thank you so much for your help and God bless you! Thanks Kristin for your response. I was surprised to learn a lot of fabric is manufactured in Europe as well, especially The Netherlands. I will try to locate who might be selling the fabric brought directly from DRC. I’ll email you privately if I can track this info down. Another possibility is http://www.culturedexpressions.com, although I think much of her fabric comes from Ghana. I am looking for works on surrender from a feminist perspective and found your (I guess it’s yours?) thesis on the topic (http://ecommons.asburyseminary.edu/jspui/handle/10910/3779). Would you mind sharing an electronic copy with me? That would be immensely appreciated. Lena–that is my thesis! I’m happy to send it to you and will try to email it to you later today. Thanks for asking.